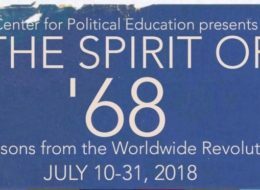 What a great pleasure it was to participate in the work of Center for Political Education. Joining the panel on how Marxism informs my work gave me the opportunity to both reflect on my work, share it with others and learn from the brilliance of both the other panelists and the class. Rachel and Isaac skillfully facilitate the class with caring and rigor; from curating the content to creating the container that allows the students to bring their whole selves. The class wasn’t didactic or ideologically rigid. Quite the contrary; Rachel and Isaac encouraged us and the students to embrace complexity, reflect honestly and stretch our political imaginations. I’d do it again in a heartbeat. I am so grateful to have had the opportunity to learn and grow in CPE’s classes this year. CPE has played a major role in expanding my political consciousness over the last year. Black Reconstruction and Marxism 101 have given me foundational historical and theoretical knowledge that I have brought to personal conversations and more explicit movement work. They have also sharpened my analytical skills and ability to identify oppressive systems/structures as they manifest in my everyday life. I came to CPE to better contextualize, process, and respond to the world I’m experiencing today. Both groups struck an ideal balance between high-level academic analyses and discussion, and tangible, applied strategy. I was reminded constantly why studying history and theory is necessary to organize, build people power, and transform systems. 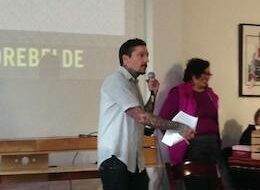 I had the privilege to work with CPE as a presenter in their “War and Liberation” series. The preparation for the event and the conversations that went into planning the event, the event itself, and reflections on the event meant that even as a panelist I came out having learned about new ideas and struggles. Throughout this process I was calling in– as I am based in Los Angeles– but the intimacy that was facilitated by CPE helped me gain new comrades and felt as if I was in the room at all times. I have since gone back and checked out many of the events and classes that CPE has put on recently, which are archived on youtube. The events are always planned with an overall curriculum in mind, so no event is one-off but it all builds on one another. It is that type of sustained organic social analysis of the current conjuncture that is very much needed. I only would wish that I was closer to CPE physically so I can be a regular attendee of all of the events. I feel incredibly lucky to have participated in the Center for Political Education’s Marxism 101 class. I can’t believe how many talented, sharp, and thirsty organizers were part of the class. The discussion reflected the mix of experience, background, identities, and political orientations that made the class so memorable for me. I loved hearing about all the work that people have been involved in – from working on disability rights and mass incarceration to transnational politics in Central America. I also want to appreciate Isaac and Rachel for the real work they put in helping me shape the class, from sharing their vision to reviewing readings. Onward! CPE helped provide a key moment of critical self-reflection for our organization. Through their powerful style of facilitation, CPE held up a clear mirror for us to (re)evaluate our campaign. They asked us questions that we hadn’t yet asked ourselves, as well as they helped us hone in our our strengths as an organization. CPE members are seasoned organizers that offered their experience and expertise in order help our organization find our footing at a pivotal moment of our campaign work. Thank you CPE! CPE really helped to unleash the potential of the Stop Urban Shield coalition and pushed us to stay focused during a really crucial time in our campaign. We definitely were sharper, more coordinated and prepared to fight for our win because of the campaign planning that CPE did with us. So proud to be an advisory member of the The Center for Political Education!! 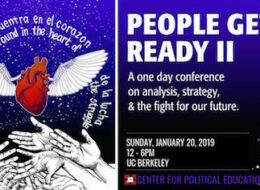 For more than a decade in my own political development, CPE was integral in connecting me more deeply as an organizer to a liberatory frame and practice. While I was in a political organization and building coalitions, it was through CPE that I was given access to space, study sessions, time to strategize with other organizers, and more. It fundamentally strengthened me as an internationalist and revolutionary Lefty. The organization is over 20 years old and has contributed to resistance work in the Bay, and across the country, in countless ways. Very few existing orgs in the Bay have held such a revolutionary history and trajectory. I’m so thankful I get to work alongside their brilliant and committed co-directors Rachel Herzing and Isaac Ontiveros, and an amazing crew of intergenerational and multi-sector advisory members! 2017 has been a hard year, by almost any measure. But one of the great pleasures of 2016-17 has been the re-emergence of the Center for Political Education. It has been truly gratifying to watch CPE’s new co-directors step up to the task of framing and hosting the kinds of conversations and learning opportunities we all so desperately need. I’m grateful to CPE for including me in the mix, and I look forward to continuing to engage with the CPE community in the education, analysis, discussion and debate that provide foundation for our daily work toward a just society. In the midst of urgent defensive fights, CPE’s contribution to our movements is more important than ever – connecting us to each other, putting our work into a broader context, building our capacity to consider and debate long-term strategy. Marxist tools of assessment have served many generations of people of color before us, and thanks to CPE, they’re available to our folks, today! 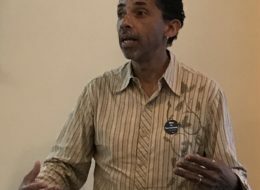 Applying Marxist principles to an analysis of our Ban the Box organizing campaign was challenging, but even preparing for the panel led to important insights. Presentations by other panelists were revelatory, and even as a 1-class participant, I learned a lot from a very engaged and lively discussion. I deeply appreciate CPE’s modern-day approach to these studies, placing Marxism squarely in our current reality and encouraging us to transform it in order to solve immediate organizing problems. So many activists coming together with such deep purpose, to study and formulate a common analysis — my experience with the Marxism 101 class was very humbling and inspiring! THANK YOU for the opportunity to work with CPE and THANK YOU for providing these programs for our community. CPE creates crucial space for organizers from different sectors and movements to learn together, apply history, reflect on strategy, and build stronger anti-imperialist politics into our US based work. CPE has made my work doing anti-racist leadership development with white organizers across the country much stronger.